SoftPlanet makes it possible for everyone to get free Capsa Network Analyzer Free Edition download directly from our servers. There is no registration needed for downloading. Today we use the Internet on a regular basis and in order to have a better experience while browsing we need a stable network. Capsa Network Analyzer Free Edition will provide it to you, because it constantly monitors your network, analyzes it and helps you prevent troubleshooting. The only limitation of the program is that you can start one project at a time. If you want more you have to buy the Enterprise version, which costs USD 995 for a one year license and maintenance. If you want to increase the time limit with one more year you have to buy it for additional USD 245. But if you don't need the app for commercial usage you can use it for free without limitations. 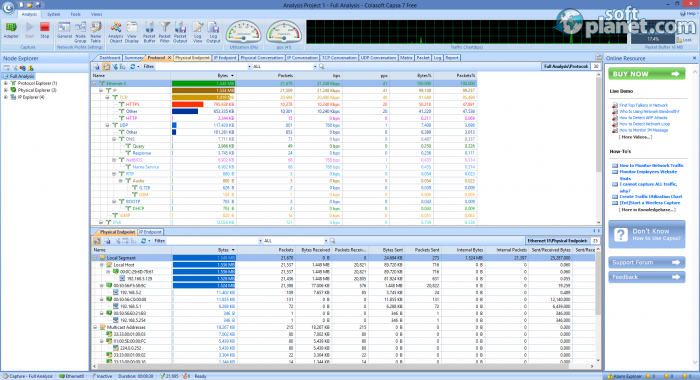 Capsa Network Analyzer Free Edition 7.8.1.4863 lets you use several modes that are specialized for different tasks. With them you can make a full analysis of your network or you can choose to start theTraffic Monitor. Also, you can make a profile that is aimed at HTTP Analysis, Email Analysis, DNS Analysis, FTP Analysis and IM Analysis. The interface of Capsa Network Analyzer Free Edition seems simple at first, but when you start any of the modes you see that it actually has a lot of sides to it. When you double-click on any of the profiles the app offers a lot of setup options that are used for the analysis. If you want to start the monitoring or the analysis you can click on the Start button and you will see that the app has a lot of instruments, which leads to a bit of a complicated interface. But after you spend some time with it you will see that all the monitoring and analysis utilities are easily used and you don't have to be a specialist in order to use them. When you start the Full Analysis option of Capsa Network Analyzer Free Edition it opens a window for you that is comprised of different panes which show the most important functions of the program. With them you can monitor the traffic in bytes, the protocols, the IP conversations and perform many more analyses and monitoring functions. There are a lot of other instruments that you will find useful after you get used to them. 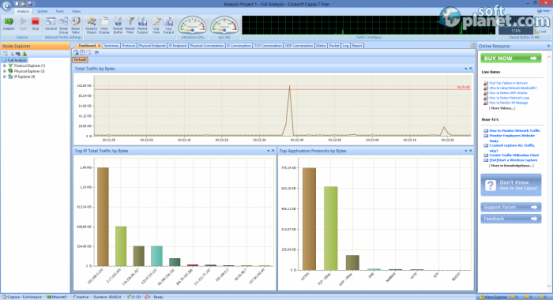 Capsa Network Analyzer Free Edition is a nice application not only because it is free, but also because with it you will be able to monitor all the aspects of your network. It offers a nice visualization for a vast number of utilities, so even though they are a lot you will still be able to use them without any problems. 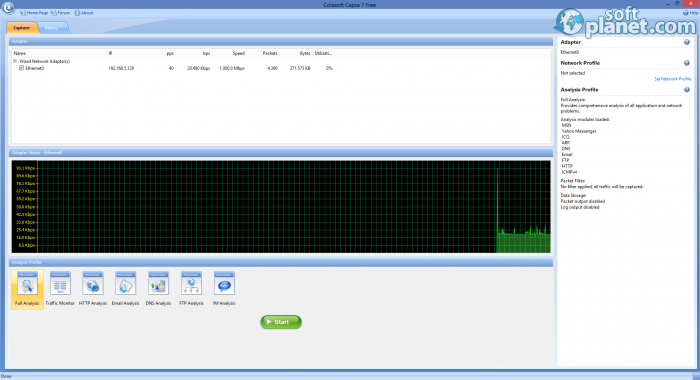 Capsa Network Analyzer Free Edition is VIRUS-FREE! Our security scan shows that Capsa Network Analyzer Free Edition is clean from viruses. The current version of Capsa Network Analyzer Free Edition has been scanned by our system, which contains 46 different anti-virus algorithms. That ensures that Capsa Network Analyzer Free Edition 7.8.1.4863 is 100% safe for your computer.